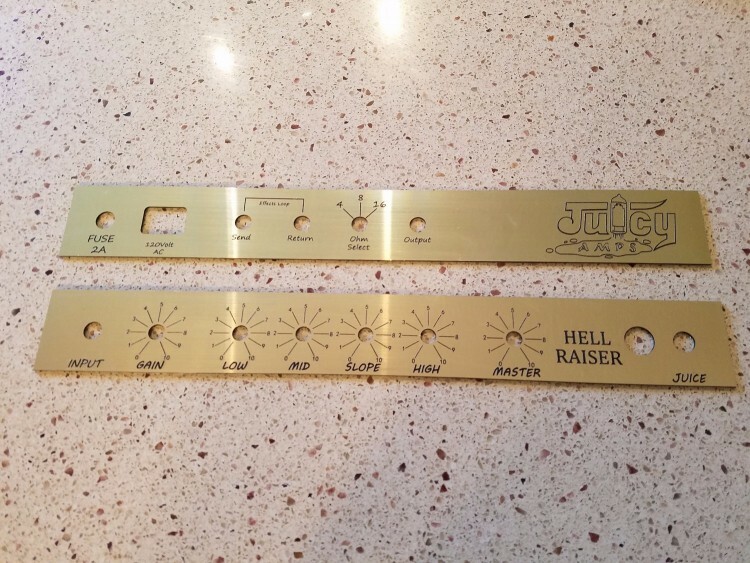 Juicy amps is now offering custom face plates! ​Front engraved two tone plastic is the most common reproduced type of face panel material. Thickness ranges from 1/32" to 1/16". All engraved plastic is cut on the laser for precise lettering and detail. Many color combinations are available and all come with 3M adhesive transfer tape for a secure fit. Basic panels start at $20 per panel or $40 per set. Call or email for more information and specific pricing. 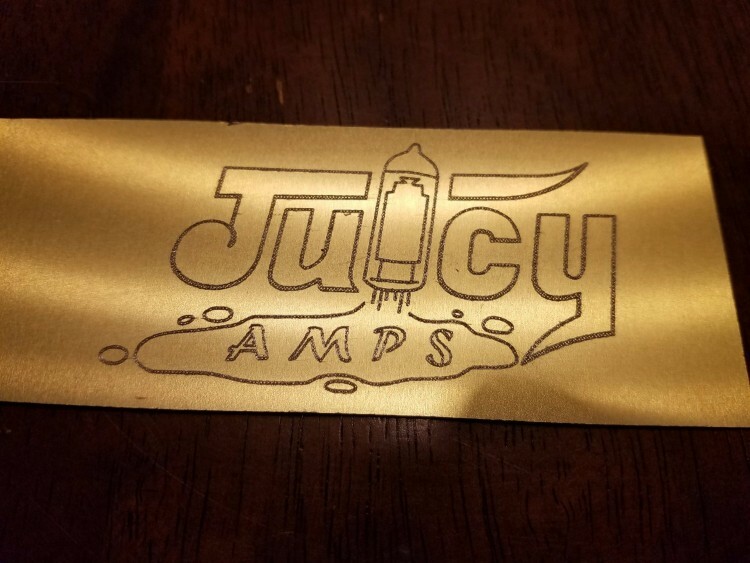 Brushed gold front engraved plastic with black lettering. This material is the more popular type of panel that has a good color contrast and is very durable and resistant to scratching. Depth of engraving is between .003 and .005 inches allowing for a smooth feel that can be easily cleaned and clear coated for a glossy like appearance. Please contact me for color options available. We also offer panels engraved in anodized aluminum in gold, black and other available colors. This material has that classic vintage look that is durable and easy to clean. Material comes in thicknesses of .020" and .025"​​. We use a special technique for engraving that allows the lettering to seems brighter by creating diagonal cross section within the engraving allowing light to be reflected in many directions giving the engraving a 3D type of effect. The aluminum panels can also be sprayed with a clear coat to give it a more shiny look. Please contact me for more information on pricing and availability. 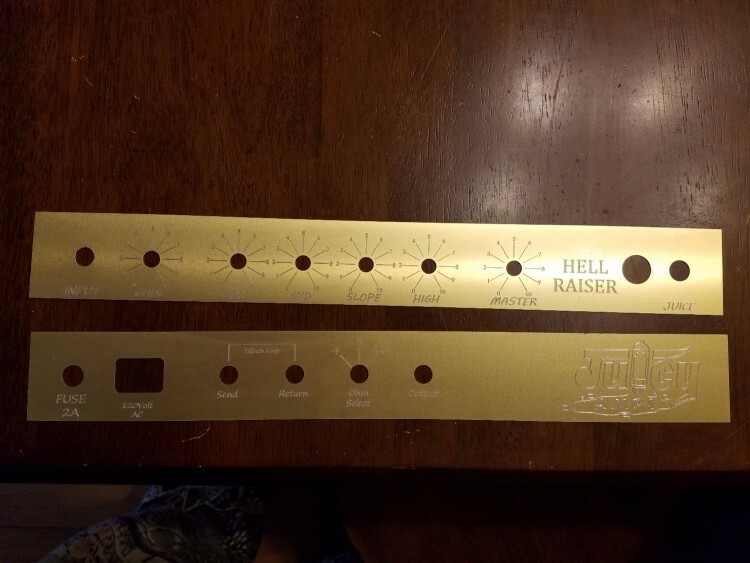 All pricing is determined by the size of the panel and how long it takes for engraving, etching to complete along with the time to complete the artwork. Individuals who provide pre-designed artwork in a compatible file format will have a minimal setup charge for each design made. Custom made artwork starts at $15 a set depending on the detail and time to complete. All panels can be made to match any custom chassis cutouts as well.